Among the more than 40,000 high school seniors that will take the national WorkKeys assessment this spring, only 1% will score high enough to receive the top platinum certification. 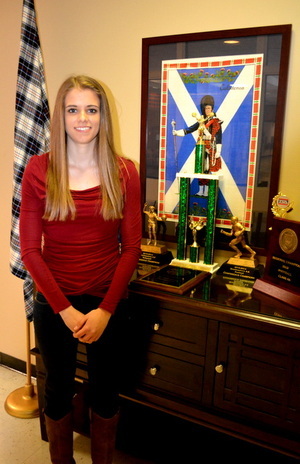 Scotland High School senior, Anna Lisa Ciarrocca, is in that 1%. While this year’s data is still being calculated, in 2012-13, only 59 students were awarded the North Carolina Career Readiness Certificate after scoring at the platinum level. The platinum Career Readiness Certificate was first introduced nationally in 2009. It is the highest WorkKeys certification available, reserved for students who obtain a Level 6 or higher in each of the assessment’s three core areas. According to ACT, Inc., platinum-certified students are eligible for more than 99 percent of the 16,000 jobs in the WorkKeys Occupational Profile Database. Platinum-certified students are also highly sought out by post-secondary colleges and universities and are very often the recipients of many of the state and nation’s most desirable scholarships. Anna Lisa, who completed the CTE Health Science pathway at Scotland High School, plans to pursue a degree in biology. She will attend Mercer University in Macon, Georgia in the fall as a prestigious Stamps Merit Scholar. Anna Lisa is the daughter of Brian and Melisa Ciarrocca of Laurinburg.